A new painting using traditional methods. Last year a long gestating plan for a painting was followed through with. In 2017 Spike MacPhee commissioned a painting of a climatic scene in the classic Science Fiction novel 'The Moon Is A Harsh Mistress' by Robert A, Heinlein. I had never read it, but my appetite was whetted by the pages showing the actual scene to be portrayed. I bought a used copy on line and soon read the story and reread the most relevant sections, This is justifiably considered among the greatest Science Fiction books ever written, Even with some dated ideas in the context of unknowable technological progress over 50 years, the brilliance of the forays into artificial intelligence, government and human nature show inspired knowledgeable pondering applied to his scenario of a future independence movement. In the aftermath of a raid by Earth soldiers being beaten back with high losses, a retaliatory bombardment is done against an array of Earth targets, first in North America. Large steel canisters normally filled with grain shipped to clients on Earth are instead filled with rock and redirected to the targets with on board rockets. The launcher for these canisters is a long magnetic 'rail gun' or 'mass driver' as Gerard K. O'Neill's version of this idea was called. A stream of projectiles were hurled beyond Lunar escape velocity and exactingly choreographed by 'Mike', the sentient computer, to land essentially instantaneously across North and Central America. My painting depicts this moment, with West to East impacts spread out by about one second to show the relative development of the impacts. Each mass strikes with two kilotons of energy. Like large meteors, the projectiles excavate craters a few hundred meters across if on land, or cause immense local flooding if done in water near a shore. The plan was to just miss large population centers while dramatically demonstrating the Moon's ability to fight a war for independence. The impacts were thus a fraction of the energy of Meteor Crater, but still well above conventional non-nuclear bombs in energy. I composed an overview that would take in all the impacts from Alaska to Mexico. The time of the counterattack was apparently worked out in some detail by the author, perhaps referring to astronomical tables or conceivably a computer database. Although the painting itself was entirely hand crafted, I made use of digital resources in the 'preliminary drawing' stage. First the actual view was sought out in 'Starry Night' software on an old laptop. I found the best fit to the lighting geometry at 8AM Eastern Time or 13:00 GMT October 13, 2076. A suitable vantage point of Earth, with the proper star background, was captured and became the first source material. But a lot more work was to come. 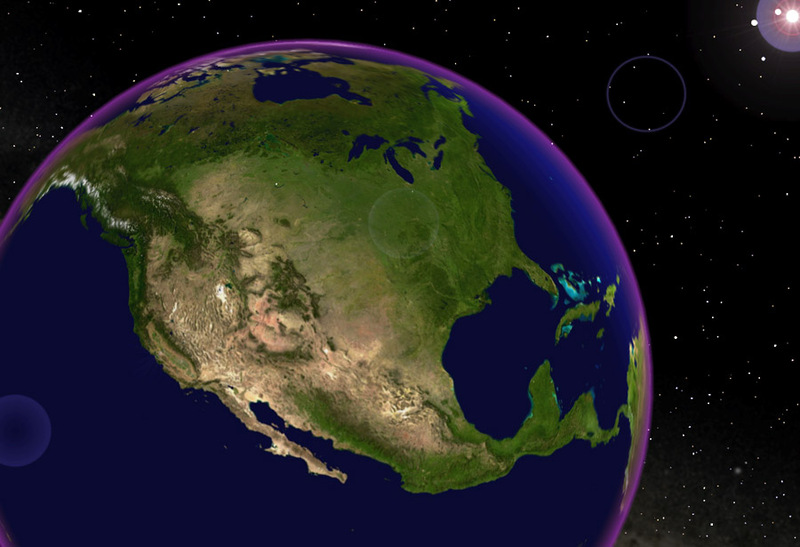 I next made a detailed rendering from such a vantage point using high resolution Earth maps applied to a huge many faceted sphere. This was to provide the visual reference for the detailed textures to be hand painted. A fairly detailed digital preliminary drawing to establish the colors and tonal values was made as a guide for the physical painting. This was painted in Photoshop, deciding things like the placement of the clouds with the luxury of changing ones mind and trying anew. No such option would exist with the physical painting. Barely any 'undo' option, especially once paint had dried. The digital preliminary was the basis for final approval before starting the work, and then the physical process of creating the painting began. In the 'old days', I would make perspective drawings and such and fit drawings of the results onto tracing paper to help transfer such preliminary work to the surface of the artwork at the beginning. Now the computer can be a kind of 'apprentice' for such perspective work, which I used to have to do using drafting and perspective drawing methods. A full sized grid was made in pencil on tracing paper, turned over and the '+' intersections all delicately transferred by a stylus to leave some pencil graphite on the gessoed masonite panel surface. Then a full sized mockup, as a guide to cutting the masks needed for such an airbrush painting, was prepared by scanning and processing the gridded preliminary to emphasize the edges. Using an enlarging photocopy machine I scaled it to the exact size of the panel. Next the airbrushing masks, or 'friskets', had to be cut. Fortunately I kept some acetate from my animation days and 40 year old precision craft knives. 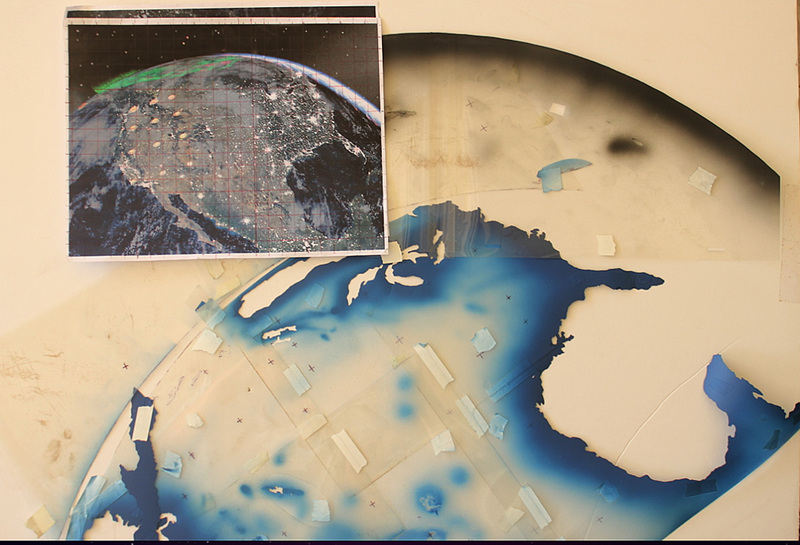 Referring to a detailed atlas, on acetate sheets taped over the 'paper master' I carefully cut out the coastlines and major lakes, ending up with mask sets to keep the major spraying of blue ocean paint off the land areas. The other was to define the curved edge of Earth and mask off the major spraying of the black space background. In the mean time batches of paint to represent the major colors to be used, such as moonlit ocean, moonlit dark land and moonlit clouds were applied to stiff card stock, allowed to dry outdoors then examined in sunlight to make sure the proper relative brightnesses were present. 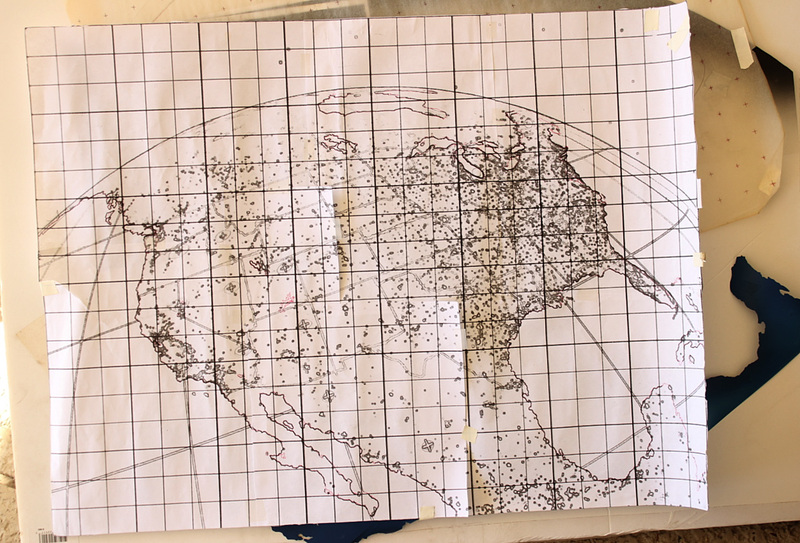 Here is the gridded version of the digital preliminary drawing along with some of the masks after their use.